Once the puppy squad and their coaches arrive, you and your friends will enjoy a 15 minute cuddle huddle. Ideally you have an enclosed space ready for Team Ruff and Team Fluff gametime! The Puppy playtime is $30, which will be donated to support the participating shelters and rescues. The first lucky fans already spent time with the Puppy Bowl puppies. See the Tweets below. Demand is going to be high as many will want to play the cute little Puppies. 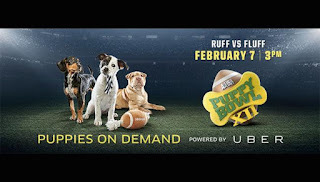 Uber will try to deliver as much puppy playtime as possible, but availability is limited. If you can’t get a visit from #UberPuppyBowl today, you can still support the shelters and rescues by visiting Global Giving. Super Bowl 50 will take place on February 7, 2016, in Santa Clara, at the Levi's Stadium. The stadium is the home of the home of the San Francisco 49ers. Super Bowl 50 will be topping all previous Super Bowl's because of the anniversary. Marketers are flocking to Super Bowl 50 and it will be a huge TV event. Read our Super Bowl 50 Facts to learn everything important about Super Bowl 50. Read the latest Super Bowl 50 News.